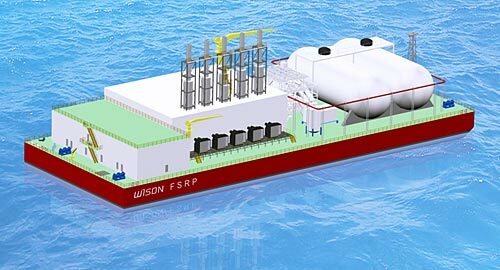 Wison Offshore & Marine has announced that its newly developed floating storage regasification and power generation barge (W-FSRP) has received Approval in Principle from Bureau Veritas. W-FSRP integrates functions of LNG loading and storage facilities, regasification and power generation. Wison and Bureau Veritas have completed the validation for the specified design of 50MW FSRP this time. W-FSRP 50MW is designed to supply 50MW electrical power using LNG as primary fuel and MDO/HFO as backup. The FSRP will be of shallow draft barge type moored at a jetty, inter coastal or alongside river bank where the environmental condition is benign. Integrated on board LNG storage, regasification facility, and power plant. Can be easily towed/shipped and installed in remote areas. Either LNG storage or MDO storage allows about 14 days operation. However a larger hull to accommodate more MDO storage or bigger LNG tanks can be available if requested by customer.